Solar jobs come in many shapes and sizes. In Part 1 of Solar Jobs: Learning the Solar Business, Erik Bakke of SMA Solar Technology gave us background information on solar energy, the solar business and sales. In Part 2, he explains that there are solar jobs all over America. He provides information about how to get solar jobs and the different roles that need to be filled: like solar panel installation, tech support engineer, residential solar sales, commercial solar sales and more. Interested in green careers? You may want to check out these cool sites on sustainability , green technology, and the balance between nature and technology. Erik suggests learning about solar energy and solar jobs from the Solar Living Institute and Solar Energy International (“SEI”). Anyone considering green careers or jobs in solar energy should watch this interview to learn about the possibilities: particularly aspiring solar sales people of any background from psych majors to English majors to engineers. Careers Out There Host Marc Luber: This is picking up from where we left off in Part 1: We’ve painted the picture of what is solar, why it’s important, why it’s exciting for you, and sales as well, so that brings the 2 together to your career path right now. So now it would make sense to walk us through your typical day. What is a typical day for Erik Bakke? Fill us in. Commercial Solar Sales Manager Erik Bakke: Well, if I’m not on an airplane or going to a particular customer, actually let’s start with that. That is half of my typical days, traveling to some location to meet with an individual or a group of individuals who are interested in our product. So, we’re following up on a lead that we’ve had from either they were asking directly or somebody told us that they’d be interested and we contacted them and found a way to set up a meeting and a presentation. And really, what I try to do, is say hey, I want to educate. Again, I want to help you understand. And that’s the neat thing about solar right now is that a lot of people are very curious. So it’s easy to sell that part, to get in the door. It’s easy to get there and unfortunately we spend a lot of time out there educating a broad amount of folks and many of them will never or do not have the need to actually make a decision. It may be eventually that they make a decision about our product, but so anyway, that’s another side of it. SALES PRESENTATIONS: So we’ll go into a presentation, we’ll sit down with the group and ask them, I tend to start the conversation about why are you here? What are you expecting to learn? What would you like to get from this hour of time that I’ve booked? I know you’re busy and I know that you probably have 6 emails coming in and several phone calls, but if we could put those aside and focus. And people really respond to that really well. They say yeah, OK, this is great, he wants to hear from me what I care about. Sometimes we’ll even get up and write it on the white board. You know, there’s 4 things that sound like they’re real important to you. OK, so now I’ll dive into my presentation. I’ll introduce my company and myself, who we are in the market, and why we have credibility to be there and why they should even listen to us. And then introduce some of our products. Typically, we’ll tailor those discussions around specific products that matter to that application, that they just mentioned their particular need. We’ll focus, I try to at least, focus on each one of their key points throughout the presentation. Find those key benefits or features that we bring to the table that are different from our competitors, that actually differentiate us in the minds of the marketplace, and show them how they tie into their need for knowledge. And usually ask them right in the middle does that really help you to understand this question? Can we check that one off? And do you have any other questions? That usually gets the dialogue going. So while I like to just be the guy up there doing a lecture, I have to force myself to get back to my audience and say is this what you need and tell me more, now that you know this, tell me more about that. BUILDING RAPPORT: So that’s one typical day. And then there’s all the travel in between. There’s taking them out to lunch and getting to know them personally, or dinner and getting to know them personally, or golfing, if in fact we can fit that into a day. But lately time has been too crunched to get 4 hours of golf in. So there’s the personal side. We try to build that rapport and understanding of the individuals personally. Then we get back to the office. PRIORITIZING: A typical day in the office: you look at your huge list of opportunities that you have – I call it the funnel. So the funnel is everything that’s out there – all of the potential that you know about. It may be something that you just heard about from a press release, or something that you know is coming because of some policy change, or an incentive that’s come up. And you look at all of those customers that you think are potentially ready to make a decision or will be soon, and you have to decide which ones do I want to focus on today. And hopefully you’re able to one screen out those folks that are not going to matter to your success and get to the point where you have just a few key individuals or key companies that you can target, and many times you have that list of things you would like to proactively go after, but in this industry right now, we’re so busy dealing with the folks that are calling constantly to learn and everybody’s got a huge project that they want to do, and they may be 1 of 5 that have this project. They all want quotes, they all want solutions, they all want to be the best, they all want to get their price down, they all want to have the best solution, and they’re all competing. And so it’s really about prioritization and deciding each day, each moment, OK, where do I want to focus today. So every morning I try to make a list and every afternoon I try to revise that list of these are the key actions that we think we need to do to influence folks to purchase our equipment. And which ones are the most important and go after them and try to push them out to others within the organization for them to get done, but then bring it back to making that phone call, setting up that next meeting, sending out that document that specifies why they need to use your product, or that gives them the technical details they need that are follow-up from, you know, now that they’ve learned you’re the greatest thing ever, they need to put it into their package, and so they have to have every kind of detail they can get to build a solution internally. REACTIVE NATURE: So, I’d have to say I’d like to be focused on identifying the next solution and going out and tackling it, but more of it’s just answering the phone and talking to people who are interested in our product or who have heard from me before and want to get some follow-up information. It’s very reactive at the moment, unfortunately. Host Marc Luber: Interesting. So it’s really a sales job of a technology product that is incredibly hot at the moment. Commercial Solar Sales Manager Erik Bakke: That’s absolutely true, yeah. And unfortunately, it’s a technology product that people are not familiar with at all, in many cases. And that’s the other part of our job is looking at our customer base, our funnel, and saying which one of these folks have a chance to win. And sort of having that discussion internally with our own team that have interfaced with that customer. Do they have the chance to win? What can we do to help them win because we know that they are advocates for our solution? Or do we know that they may have a chance to win – or let’s say that they don’t have any chance to win, OK let’s just somehow nicely fulfill their request without putting a whole lot of extra energy or work into it. That’s the difficult part. How do you keep those folks that today are not successful but might be in the future? So you cannot just ignore but you have to focus your attention on the ones that are going to win. That’s really the struggle, the challenge every day. Some actually have the knowledge and don’t need the education. Sometimes they’re more difficult because they’ve dug down into the little tiny details. That’s when we try to put them off into our technical support folks to help. As sales guys we just can’t get into those details. And so we try to focus on the folks that have a chance to win, are not necessarily as knowledgeable as they should be, or could be, and so we want to help them as a partner, as a consultant, to get past that point with the knowledge they need to win that project. Luber: So now explain this, because in order to do all that, in order to do any hand holding or any good, detailed explanation of all this stuff, in addition to being good at sales, you have to have a really good grasp of the technology. So that leads me to asking about your background. If I have this right, your undergrad degree is in mechanical engineering and energy? Is that right? Guest: That’s correct. So what am I doing in an electrical company? I ask myself that sometimes. Luber: It’s a similar brain though. Isn’t it a similar type of thinking? Guest: Yes, certainly, a lot of the concepts. Really solar is a simple electrical solution. The complexity is in the black box of the inverter, and I have technologists behind me that help me on that. A lot of it I learned in school, in mechanical engineering in your basic undergrad technology courses, DC and AC circuits are fundamental, so certainly I think any engineering degree just about will suffice to do my role. Electrical would be good. That would help. But also as a sales guy, you need a certain amount of technical, but you’ve gotta know when to step back and say this isn’t my role any longer. I need to bring in a technologist. So we have technical sales support engineers that stand at our side during the presentations many times, or back us up with detailed calculations or designs, or discussions and using different tools to help our customers bridge that technical gap. We should really be focused just a little above that guy who is making the technical design, but we need to make sure we plug that guy in with our individual who can help them directly. It’s really important – we’re always looking for good technology support, engineering types to help us. Luber: OK, so that’s another path for people watching. If you’re not a sales person but you’re a strong technology person…. Guest: Yeah. And I’d say one of the key questions here is how do you get to a sales role. I actually bridged the industry, or the market, within the energy industry. Being a sales guy, I was able to bridge from gas turbines to solar technology because I had those skills. So that’s one path in to the green world. But another is to come in through the technology side and really support from the ground up and learn the product inside and out and then become a sales guy. To me, I think that’s important as well. I think it’s important to have that background, that knowledge, so you don’t say things that lose credibility in your customer’s eyes like he doesn’t really know what he’s talking about, he’s just a sales guy. You see them out there all the time and I think credibility is important. So I think that’s one path is to come up through the technology side and gain enough knowledge and really learn the market from the bottom up and then become a good sales guy to support. The other side is to come across as a person who knows how to do consultative sales and can draw on the solutions that he needs from the organization that is already existing. So there’s many ways to get here. Luber: So if someone’s watching and they’re a salesperson and they’re thinking I’m the best salesperson around. They don’t sell technology, they definitely don’t sell solar, and this area excites them because they see a big future in it. Should they pursue it or are they going to be swallowed up by people who have a background like yours and really, really know this stuff? Guest: Well, that’s a good question. I certainly have hired people that came out of real estate sales, for instance, to do the residential sales. When you’re talking over the kitchen table, it’s many of the same concepts and you really don’t need the technology level at that point. I really believe that even at the business-to-business level, a good sales guy can draw on the resources that he needs to be successful in this industry without any sort of technology influence. It helps though, it certainly helps to bring some credibility. But if you can’t do it, you need to be able to admit it immediately to your customer that you know, hey – I’m here to plug the right people in with you and I’ve brought this guy and he’s going to tell us all about that. You need to know at least what’s important and be able to steer the conversation with the right people behind you. Luber: So then it sounds like what you’re saying as far as career transitions for people looking to move into this area from other areas, it sounds like they could come from a lot of different areas into this area. Is that the case? Guest: They certainly are. We see people coming from all over. Interesting enough, we have a lot of telecom folks coming in. At least at our company, I’ve seen a few coming in from the telecom industry. Yeah, I think it’s open and it’s growing so quickly now that if you bring skills that are not here today in this market, you may actually create things and refine the marketplace in and of itself. What I mean by that is it used to be hippies and drug growers, pot growers, that were into solar because they were off the grid and they valued the earth. There are still a lot of those in here, a lot of them around that are the old timers, let’s say. Some of them have not transitioned to a more professional business approach and they’re being swallowed up and being relegated to the back office. The times have really changed over the last couple of years. I’ve seen it go from the Wild West…and not to say we’re in a mature market by any sense of the word, but now the real power players are coming in. And when I say power, I mean both from a figurative standpoint where these guys in the suits or the fast-talker developer types who know where to get the money and know how to make things happen, but also the real fossil power plant power or nuclear power builders, the construction firms, the engineering firms, the Bechtels of the world are entering this space because there’s no work elsewhere for one, and they have skills that apply. They can actually help the solar industry become a viable solution, an economic solution and reach what we call grid parity. That’s a unique term for solar energy, and that means the cost to generate the energy should be less than the value of selling it in the marketplace. So there should be some profit in it. Right now there’s no profit in it because it costs more per kilowatt hour to generate the electricity than you can sell it for in the marketplace. And so without subsidies, we’re not at grid parity. But we’re rapidly approaching it, and I think within a few years. And even in some markets, like where I live here in Northern California, it’s currently at grid parity. Of course, that’s with subsidies, but we’re there – we’re really getting there to the point where it makes sense. Luber: Now are you finding that there’s jobs like yours, whether with your company or other similar companies, are there jobs all over America or are they really located in just a few cities? Guest: Yeah, let’s say one year ago it was really California and New Jersey. Oddly enough, New Jersey had a strong solar renewable energy credit program where they actually paid for solar energy. So those were the 2 locations where you needed to be. Now it’s become nationwide. There’s not a lot going on in Idaho right now, but there’s National Labs I think there, but other than that, there’s not a lot of the market there. But we’re finding that Ohio is a huge market now, and Texas and New Mexico. Of course the sunbelt states are going to be, or should be, early adopters. There’s other political issues there as well, but it’s becoming ubiquitous across the United States. In fact, I think that’s the interesting thing – if you could bring some knowledge of the technology or the solution – maybe coming out to Colorado or California and attending some courses and getting into some of these programs that are available to learn about solar and then bring that back to a state like Michigan, you might find that all of a sudden you are a really valuable individual. Guest: You’re the leader, absolutely. In that market, absolutely. Luber: Yeah, that’s good advice. So would you say that in some of these states like Ohio, Texas, New Mexico where you said there’s activity, are there both white and blue collar type positions that people could be grabbing whether sales in the office or boots on the roof and nailing in the panels and stuff like that? Guest: Oh, absolutely. Absolutely. I mean from technology and engineering jobs to design and sales…all the way through to actually putting the technology on the roof or in the ground. Absolutely, there’s a broad spectrum of jobs available. Luber: That’s good to know. So everyone watching – there’s stuff happening for you! Guest: Yeah, and that’s just on the installation side. More and more, we’re seeing the government funding from ARRA, going into the manufacturing side. And R&D, that’s really exciting as well. I don’t know too much about that side of the business, but you see the amount of money that’s being put into investing and stimulating our economy so that we have a real growth engine in and of itself so that we can export. So in Michigan, for instance, there are some companies that are sprouting up out of the ashes of the automotive industry, and a lot of that technology applies to manufacturing in this industry as well. Luber: So it could be a good transition for people. Luber: Good. So let’s say this all sounds really good to me – and whether I’m in high school, or I’m in college, or I’m already out there in the working world and this just sounds like something I want to do. I’ve been watching the interview, I’m liking what you’re saying and it’s getting me all fired up. What is it that you would recommend at any of those levels? What kind of major should I be taking in college? What kind of extracurricular activities can I be doing on the side whether I’m in high school or college? Or if I’m out there in the world, you mentioned taking some classes in Colorado or California. What are some things I can do to get myself an action plan for right now to get myself going towards doing what you do. Guest: To do what I do, I think it really matters that you have some technology behind you. I’ve always, again, been this consultative sales kind of guy, that thinks it’s important to have the technology basis behind you. But it’s not absolutely critical. What’s critical is that you find those programs that are focused on green energy. In some cases, there are universities and colleges that have specific courses available. I took a few technology courses when I was at university, and now there’s a lot more focus to really prepare you for the marketplace. And there are some interesting opportunities outside the institutional university level curriculums. I think if you look at the Solar Living Institute in California or SEI, Solar Energy International in Colorado, they have some hands-on technology training and what I did actually to transition is I took an online course with them. So I learned the fundamentals of solar energy by working my way through an online course. It took about a month, I think, and got kind of a certificate. It wasn’t something anybody really valued, but it gave me the ability to speak rationally about the technology and then bring my ideas about how I could help sell that technology. There’s that and then also here in California, in the Petaluma area, there’s a company, Real Goods. If you look up Real Goods, they have sort of a combined technology center. It’s really an opportunity – to go and spend and gain an internship. [ED: I BELIEVE ERIK MEANT THE SOLAR LIVING INSTITUTE PROVIDES THIS INTERNSHIP PROGRAM] You can actually live there on site and I believe they build and stay in what we call straw bale homes and yertz and if you’re kind of free and easy going and don’t have anything keeping you in one place or another you can just go. I’ve seen several good engineers and salespeople come out of that internship where they spent 6 months, actually, learning and doing different types of renewable energy solutions. And I actually hired several of those individuals and they were really assets to our company as engineers. Luber: That’s great. Let’s talk money. People are always wondering what kind of money is there in a particular field. If we’re talking about a sales person, let’s say a new sales person and then kind of look at what the growth opportunity is. I’m not going to ask you specifically what you make, so don’t worry about that. But I am interested in getting a picture of what is there financially so someone can know I’m going to make $20,000 a year or I’m going to make $2 million a year. What’s out there financially? Guest: Yeah, you know, sales, it’s really up to you how much you make. And for the most part, commission based sales really opens it up to being based on your performance specifically. So, it starts – in fact, if you come in without any or very little background in the industry, I’d say the easiest place to start in sales in solar at a residential level. There are a lot of start-up little electrical companies, or transition from residential electrical installers who are trying to gain a foothold in this burgeoning market and they need people to knock on doors and to go to home shows and to talk to people and then to be invited into their homes to do an estimate and sell the solution. And that’s a great entry level solution. It may start without a base salary at all. If you can afford to do that or you need to to gain traction, that’s one way to do it. To just go in and be paid strictly on commission. There are others that have a base and a commission. And once you get into more of the business to business area or larger scale projects, you may find that 6 figures are easily attainable with a lot of opportunity for not only commission base but bonus base. And the interesting part now, just like the dot com area, if you can find that company that’s at the beginning and hasn’t gone to an IPO yet, they may actually offer you equity. I think equity, for someone who can take that risk, maybe even work for free for a little bit of time just to gain a foothold in the company and really propel them into mainstream, there is an opportunity to make millions. So I think it runs the gamut. It depends on your ability to take risk, just like anything else. This really is the dot energy, the energy dot com era, in my eyes at least. Luber: Absolutely. So to go back to the newbie who is new at this and jumping in to do residential, working for maybe just commission or a very small base plus commission, and I ask this because there are a lot of people who are watching who might be thinking I want to get into this, start at ground zero and try to have some idea. Let’s say they’re decent, they’re not necessarily the best at the company, are you thinking $50,000 a year is possible or more? What do you think? Guest: Yeah, it’s tough because every market is a little different. We haven’t seen a maturity level here yet. There’s ups and downs and there’s companies that have some strength of brand already or have a solution that really makes sense. Again, it runs the full gamut in the range, but it’s very possible I’d say to make….two years ago I was looking at an electrical company that was starting to sell and they were offering basically $500 per kilowatt installed. Typically, you’re looking at a 3 to 5 kilowatt application. So, while I wouldn’t be making any base salary to start with them. $500 times….so $1,500 to $2,500 per sale. It was not unlikely that you could sell 4 of these a week. Well that adds up very quickly. So it seemed very very profitable. I think they moved quickly back from that to the point where they wanted to have a small base and $300 per kilowatt. So I think that was the early days and I’m not sure what’s happening today in the residential world, what kind of packages are out there. I’m a little bit removed from that now. But I think for somebody who is persuasive and good at selling the value at a time now when everybody’s on the verge of making some decision to do something for the environment anyway, there’s a huge opportunity to get in ground floor and go full commission and make a lot of money very quickly. Luber: That’s exciting! People will like hearing that. What would you say, if we were saying the best personality type for doing this. Would it be like any other sales process? Assertive, not being scared to hear no…..? Guest: Yeah, you’re right. I think assertive is definitely necessary. Certainly a thick skin. You’ve gotta know that there are a lot of reasons for people to say no to you and there’s a lot of rejection. A lot of potential rejection. You’ve gotta be able to deal with that and be able to get past that and say well, I understand why you object, but let’s see if we can’t fix that. Be resilient for sure. And you’ve gotta really like people and be able to listen and understand them. And really understand why people do what they do. I think a psych major or even an English major – I think they could have just a good chance at being successful as an engineer – maybe better. Luber: Wow. That’s very interesting. I was an English major. I don’t know that it helped me in sales, but I agree that understanding people is a huge, huge huge piece of it and just being able to listen and think how are they thinking, what can I say to help them to understand…..What’s the biggest challenge? What would you say to someone if you can’t handle this, then this path is not for you? What would that be? Guest: It’s sales, so rejection for sure. And also, currently, in solar energy, if you can’t handle chaos and change, oh boy, I guess that’s really what it comes down to. If you can’t handle a rapidly changing environment in which you’re working, every day the market conditions, the subsidies themselves, the perception of the technology, the solutions that are available, the way that you need to present them is changing. And if you can’t adapt rapidly to change, you’re probably going to be very frustrated very quickly. And because a lot of the structure that might be in place in typical, mature industries is just not there today. That to me is exciting and fun and I’m blazing the trail and I’m on the cutting edge. I’m creating my world and that’s exciting for me. If you don’t like that kind of thing, if you don’t like building new processes or dealing with people that are constantly adjusting the way things work in your company, then you’re going to be in for a kind of a wild ride that you may not enjoy. Luber: What about the lifestyle? What would you say? Is it a long day, high stress situation? Is there a life work balance? Guest: Yeah, again, it probably depends on the company that you’re in. But because we’re at the bubble stage here, there’s a great propensity for long hours. I can say that, for sure. Maybe, unfortunately, that’s part of my style. I really enjoy what I do, so I tend to spend way too much time doing it. Yeah, I think the opportunity is there to spend way too much time at work, doing what it is that we do. And for sales at my level, at the higher business to business level, there’s a lot of different places around the country that I need to be in any given week. There’s a lot of potential for travel. But again, in the residential side, I think you can really find a great balance. Managing your own time, I think again if you’re on commission, obviously it’s up to you if you get out of bed or not, so to speak. And that’s a great opportunity to have a real balance there – maybe even to supplement something else that you’re doing. Maybe not full time, but maybe you’re studying something else or doing something. But certainly, it’s a lot like real estate in that sense. There’s a lot of potential for working from home, in your car a lot possibly but hopefully relatively local region that you’re managing so that you can be at different homes or home shows in that region within moments from your home. So that in and of itself gives potential for great balance. Luber: Very interesting. So what would you say is the next step for you? Where do you want to take this? Guest: Well, I’ve just introduced the commercial and utility scale product from our German technologists to the American market in the last year and created enough huge projects that I’ve decided I need to go and manage those projects. That’s what I also love to do – is to manage the actual implementation. And I think project management should be involved as part of the sales cycle as well as part of that consulting team. So for me, really the next step is to build an execution team, a project management team, and also to help our company focus on how to build a sales and delivery team that works very close together to solve problems now and to deliver on our promises in the future. It’s really exciting and again, we’ve created a new role for me as the Commercial or Utility Projects Manager, so I’ll be moving into that as an army of one and growing that team hopefully fairly quickly. Luber: That’s great. So let’s say I’m watching and I want to be on your team. Let’s say I’m in Arkansas or I’m in Idaho or I’m anywhere and I want to join you there in the Bay Area or elsewhere. What do you look for? What would you want to see in me and in my resume if I’m watching now and I’m feeling ready to jump in and get on your team? Guest: Right. From the projects level, I’d like to see people that have been involved in this industry at the large project implementation level. 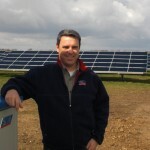 Prior to my role here as sales at SMA, I was a regional manager for a solar energy delivery team. We actually did the projects. We sold them and delivered them. So I bring that and I’d like to see others that bring that clear experience and are willing and ready to learn more about the next level of delivery of large-scale solar projects. But also from an electrical standpoint, we need people that understand the codes and standards and regulations of building a power plant – building an electrical solution out there in the world. Because a lot of the solar folks, like myself, have come along and get good at what we’re doing, but we haven’t really learned how to play in the real power world yet. So we need some of that as well. Luber: Excellent. What about keys to success? Give some keys to success to the people watching so that if they’re to go down this path and they’re saying that’s it – I’m convinced – I’m jumping onto Erik’s path. I’m jumping onto this solar path and get on the sales side of things. What are some keys to success? Guest: Well, I think learning the fundamentals about solar energy itself. Because it is a unique technology. DC generation and AC delivery. So there are some, it’s not very complicated, it’s not super complex, you’re not building rocket ships here or anything like that, but it is different. So I think what’s key is that you’ve shown to any individual that’s looking to hire you that you’ve taken the step to at least learn the basics. And those are available online, like I said, from Solar Energy International and Real Goods. And pick up a good book or 2 and just be able to converse about the basics and the fundamentals of a solar application. And then find out what your skills are that really apply, because in solar we need every skill. It’s a new business, a new market segment. We need all the skills, not just the technologists. I think understanding the keys and really understanding the market in and of itself as best you can. Luber: Very good advice. Everybody, we get real advice from real professionals here at Careers Out There. You get real professionals just like Erik Bakke. Erik, thank you so much for joining us. Definitely appreciate it. Guest: Thank you, Marc. It’s been a pleasure. It’s been fun, thanks. Luber: Thank you again everybody. Keep watching Careers Out There. I’m Marc Luber and look forward to seeing you again soon.